Bananas are healthy for you and that’s a good thing since they are the most popular fruit in North America. Everyone loves bananas. There are more songs, jokes and and silliness with this food than with any other plant on earth. 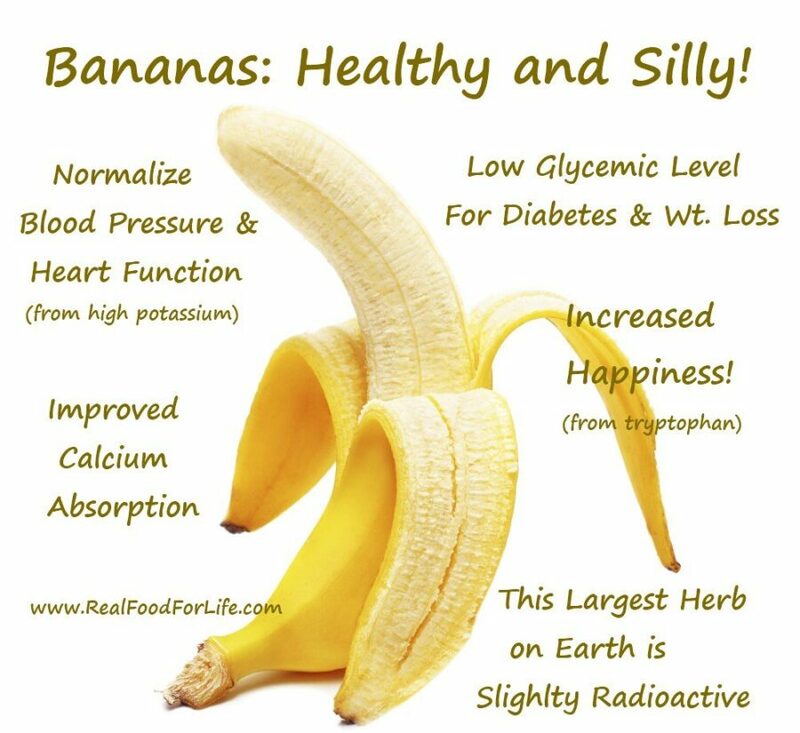 Bananas are powerfoods! 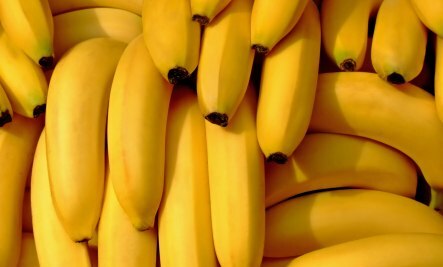 1 cup of bananas has a whopping 800 mg of potassium. Most Americans have an imbalanced sodium/potassium balance which is correlated with hypertension, heart disease and diabetes. This is also critical for nerve impulse transmission and muscle contraction. Bananas contain significant amounts of pectin, a soluble fiber. Although bananas have a lot of sugars, these digest relatively slowly with a glycemic index of 30 for unripe bananas and 60 for ripe. This means you get energy without the rapid blood sugar yo-yo. Bananas are high in fructooligosaccharide, a probiotic that encourages growth of friendly bacteria. These friendly bacteria promote proper digestion, including calcium and other minerals. They also reduce the risk of colon cancer. Bananas are naturally an antacid. Eating a banana helps with heartburn. The banana is the largest herb on earth. What looks like a banana tree is not a tree but a herbaceous plant that grows up to 40 feet tall. All bananas are slightly radioactive. Along with their high potassium content come small amounts of the isotope potassium-40, found in all naturally occurring potassium. The yellow banana you eat is a mutant: a genetic variation on the hundreds of other varieties and rainbow of colors. The yellow banana is the sweetest. United States immigrants were given bananas when they reached Ellis Island in New York. Many had never seen a banana before. They didn’t know they needed to peel them and ate them whole. 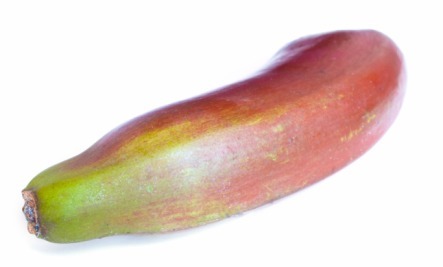 Some bananas are fuzzy pink; some when cooked taste like strawberries. There are over 500 varieties of bananas; they come in many shapes and sizes, from small finger fruits to big purple plantains. Many species of bananas have lower sugar content than the common yellow banana, and are often cooked. These are commonly referred to as plantains. Bananas are a rich source of potassium. A 100 g fruit provides 358 mg potassium. Bananas have three times the vitamin C as apples. There are about 110 calories in a banana. Like many fruits, bananas are alkaline-forming. One banana contains 3 grams of fiber and 1 gram of protein. They are a good source of vitamin B6 (pyridoxine). 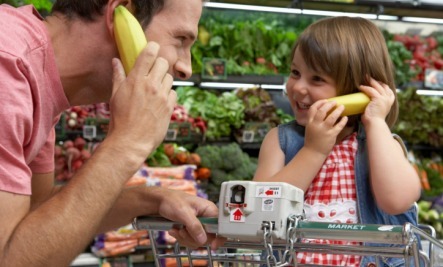 Bananas also have minerals like copper, magnesium, and manganese. 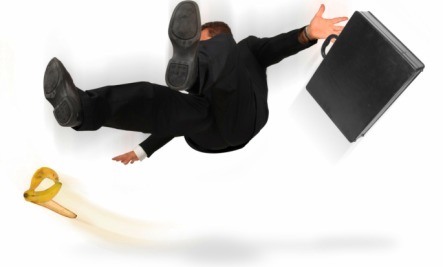 There were more than 300 banana accidents in Britain in 2001, mostly from people slipping on skins. You can buy banana beer in East Africa. Although the banana is considered a phallic symbol in many cultures, with many crude jokes in the west, the banana fruit is produced asexually. 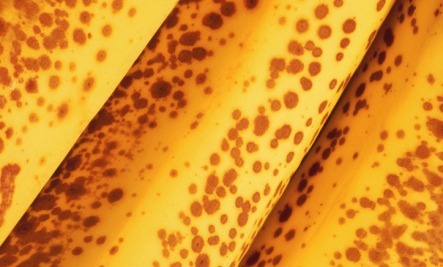 Ripe bananas are florescent when exposed to ultraviolet light. Bananas grow in Iceland. Well, actually in greenhouses heated by volcanic underground springs. The yellow bananas we eat now are called Dwarf Cavandish (or just Cavandish). This particular species was chosen for its transportation and shelf life rather than its taste. They became popular after their predecessor the Gros Michel was commercially wiped out by disease. Most people agree the Gros Michel tasted much better. During the Gros Michel time, bananas were more popular than they are today. That is why there are so many songs and skits involving bananas. Bananas were so popular that in some areas, modern garbage pickup started because of the need to deal with the mounds of bananas peels left over. The Cavandish may also be wiped out commercially. Hopefully the next major brand will be taste better! Chiquita Banana Song: Lip synced by a grandma…educational too. Bananas are picked when they are green because they ripen after being picked. Most commercial bananas are picked unripe (green) and shipped in containers just cool enough to stop ripening. Once at the market they are stored at higher temps with just a small amount of ethylene gas until they are yellow or green yellow. Since bananas (and other fruits) produce their own ethylene gas, you can put them in a sealed container to ripen them faster. Adding other fruit, like an apple, will also help. If you put bananas in your fridge, this will make the skins brown and stop the ripening process. Most commercial bananas are fumigated. Monkeys and chimps can tell the difference – they will eat the whole banana if it is organic, but will only eat the inner fruit if not. Bananas have the most antioxidants when they are the most ripe! Bananas have been cultivated in Asia from seven- to ten-thousand years but modern banana production for the west has been centered in banana plantations in the Caribbean and Central America. These plantations have been accused of not contributing to the local or national economy or well being. Huge multinational corporations (like Chiquita and Dole) developed the banana industry and used political manipulation to further their commercial interests along with US international interests. This is why the terms “Banana Republic” and “banana war” arose. In eastern energetic orientation, the banana is both cooling and wet. This is a great balance for hot dry conditions but may be unbalancing for certain constitutions or situations such as a cold or flu. Bananas, like avocados and chestnuts contain chitinases, that are associated with the latex-fruit allergy syndrome. If you have an allergy to latex there is the possibility of a reaction. This effect may be moderated for organic and cooked bananas. Dr. Oz commissioned his researchers to find the best treatment for damaged hair and they ended up with bananas. Banana Pudding: This is easy peasy to make… and delicious! Green Smoothie with Banana: In less than 3 minutes you can whip up a green smoothie that is the healthiest way possible to start your day. I have a fruit salad comprising of mango or pawpaw, watermelon, banana and avocado – daily with my lunch. what are the health benefits of such a combination? I have had dark spots on my skin ( I am African) and they are slowly but surely clearing up.